If you’ve ever played basketball, there’s a high chance you’ve experienced the brief moment where you land awkwardly and become unsure as to what will become of your ankle. Sometimes your ankle holds up, and you play on. Other times, your ankle gives way, and the pain begins. Whether it you roll, sprain or tear it, it’s sure you keep you on the sideline for weeks if not months. So what’s the best way to combat this? Well naturally buying an ankle brace is the first step – and probably the most efficient way to keep your ankle stable. This isn’t for everyone though. Ankle braces and straps may feel uncomfortable. What’s the alternative? Buying the best basketball shoe for ankle support. With the huge amount of jumping and running involved in either indoor or outdoor play, it’s important to buy a high-top, solid shoe that will keep your ankle always feeling safe and secure. In this guide, we break down the best options out on the market at this point in time. We look to PRICE, QUALITY and DURABILITY of the shoe in order to make our judgement. Following this, we break down the fundamental factors you MUST keep in mind when purchasing a high quality shoe that is most suited to supporting your ankles. When you think of Basketball, one of the most prominent names in modern times is Lebron James. A legend and a humble ambassador of the sport, you wouldn’t think he’d plaster his name on a poor product. And in our opinion, he hasn’t. 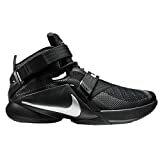 The Nike Men’s Lebron Soldier IX is undoubtedly a high quality shoe in it’s market, made by industry leading shoe maker Nike – we’ve also picked it as our best outdoor basketball shoe! This signature shoe used by the superstar himself are seriously made with great quality and features. One of the most interesting aspects of the shoes is the clever usage of flywire cables in the midfoot strap. This helps to reduce the weight of the shoe by a fair amount, and as a result, largely improves the lateral support offered. Lateral support in any form will help reduce your risk to any kind of ankle injury to a player. Another feature that is highlighted by this shoe is the mesh construction of the shoe. This allows for maximum air circulation, offering great breathability to keep your feet from sitting in a sweat-filled mess. This is particularly exceptional to the Lebron Soldier IX shoe. Finally, whilst probably not ankle specific, the sole of this basketball shoe is made using high-quality rubber. This provides an excellent amount of grip, that ensures that you remain control of your feet at all times. For us, this is the entire package, and we can’t pass up this show when looking for the best basketball shoe for ankle support and total control. When trying to pin point the main reasons that ankle sprains occur for basketball players, there is no doubt that a huge factor stems from awkward landing. This is particularly prevalent after a frantic jump either to stop a player, or in the process of making a shot. As a way to directly target these situations, a shoe that offers better-cushioning support should in turn reduce a risk to ankle injuries. Good cushioning of the shoe will absorb most of the shock, ensuring that the player is in full control of his feet upon landing. 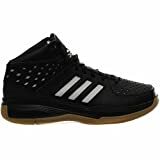 Adidas, one of the leading sports shoe manufacturers, as a way to offer a shoe with fantastic cushioning, have created the Men’s Court Fury Basketball Shoe. These basketball shoes come with Adiprene footbed. If you haven’t heard about it, simply put, it’s Adidas’s technology that focus on a soft but stable cushioning for the sole of the shoe. This sole is also springy, and responsive; perfect for lively push-offs. Further, the Men’s Court Fury shoe provide ultimate comfort. The perforated upper enhances the air-flow allowing for the best possible breathability of your feet. Superior traction with the help of a non-marking rubber outsole. No matter you are playing indoor or outdoor, the Men’s Court Fury Basketball Shoe always give the needed grip on any surface. An excellent choice for basketball professionals looking for the best basketball shoe with ankle support. If you’re familiar with the Hyperdunk range, you’d know that a new design is released every year. However, while there are a whole heap of different Hyperdunks – we focus on, and recommend the the 2016 model here. We note that the 2016 Hyperdunks come in either a regular version, or an upgraded (and more expensive) flyknit version. Although the regular and flyknit version may look slightly different, in terms of ankle support, they’re very similar shoes. The Nike Men’s HyperDunk offers excellent ankle support for basketball players through its unique construction. Both shoes offer some form of material that covers the ankle as a way to provide plenty of support. This is provided for by a textile material completely covering the ankle. Whilst there is a lot of ankle coverage provided by these shoes, we note that the shoes haven’t been made with ankle support in mind. It’s merely just by chance that the design and construction of the shoe suitably fits the needs for a baller looking for a good high-top shoe with great ankle support. Supreme comfort is also prominent with the 2016 Hyperdunks. This is due to the exclusive Nike technology that is behind the lightweight nature of the shoe. They fit snug, but don’t feel tight at all. The perfect balance of fit and support. Historically, this is a shoe that won’t let you down. If you aren’t looking for adidas or Nike, then the Under Armor ClutchFit Drive III might be the shoe for you. As you probably know, Steph Curry dons the UA gear in game. Due to his significant history of ankle problems (which we look to in our ankle support buying guide), Steph started endorsing Under Armor for its top-class quality and great ankle support. The reason the UA ClutchFit is known for their great ankle support is that they are specifically designed to with quality materials and to surround your foot to the maximum. They almost act like a second skin to your feet to provide a snug fit. When looking for a snug fit however, the shoe needs to fit tight on your feet – but also shouldn’t suffocate your blood flow. Finally, another great feature of the UA ClutchFit is the extended traction that these shoes provide. It could be devastating when you see your shoe slip under you when you are making a hard and sharp cut. This is usually the biggest cause of ankle injuries. To minimise this, the Clutch Fit comes with a unique herringbone traction that provides ultimate traction and minimal slipping. You won’t be disappointed here. The next and final basketball shoe that makes the list of basketball shoes offering great ankle support is again made by Under Armor. Namely, we look at the Under Armor Lockdown here. If you’re looking for a bit of a bargain bin shoe, these may be your go to. They’re usually sold at a great price – and don’t break the bank to purchase. Keep an eye out on your options here. In terms of the actual shoe, the UA Lockdown provides you with everything a basketball player looking for ankle support could need. This is seen through the unique patented feature of the exclusive EVA sock liner that provides extreme cushioning and support for your feet. We will admit. The UA Lockdown isn’t exactly the best looking shoe. If you’re solely focused on style, then it’s probably better to look to the Nike or adidas options on this list. However, Under Armor does deliver on high quality shoes that add awesome comfort to your ankle. The shoe is made using high quality lightweight synthetic materials. Durable, and won’t let you down during hard play. They’re made to last. This is in addition to the excellent traction offered by the UA Lockdown. Traction is particularly prevalent because of its top quality rubber sole and multi-direction traction pattern. This, again, will ensure that you remain in control of your feet at all times – especially after a questionable landing. If you’re not too fussed about the overall aesthetics of these shoes, then you may find that they are some of the best on the market that offer ankle support. When it comes to finding the best basketball shoes for ankle support, it’s pretty obvious that you can’t just go along buying shoes that are advertised with better ankle support. Each element of a shoe plays a different role in the overall ankle support provided. Here we outline the necessary elements you need to look for when looking for a shoe that offers some form of ankle support. Yeah you’ve probably guessed this straight away. If you want a basketball shoe to provide ankle support (without the aid of any ankle brace), then you’ll need a high top shoe. As expected, high top shoes offer stability around your ankle to prevent rolls. This style of shoe offers great lateral support and traction. Whilst it may take some getting used to in the initial phases, low and mid-top shoes just won’t cut it in the context of ankle support. Want proof? How many NBA players wear mid or low top shoes? Case closed. Next on the list of factors; traction. Irrespective of indoor or outdoor play, if you don’t have control over your feet, then there’s a higher chance you’ll either slip out and roll your ankle. Any shoe you buy should offer comfortable grip in order to provide you with the confidence to play comfortably on the court. To become the best possible player you can be, it’s important to make split second decisions as to what moves you’ll make next. The last thing you should be worrying about is whether your feet will slip out from under you. Excellent traction will prevent slippage, and as a direct result, forms part of the preventative measure to minimalizing any ankle injuries. If your shoe isn’t comfortable, or just doesn’t fit well – then don’t buy it. If the shoe is too big, then it’s possible that the shoe will slip off your feet. Alternatively, where the shoe doesn’t slip off – it’s very possible that your feet will move a lot inside your shoe during game play – pretty much nullifying any support offered. Buy a shoe that is too tight? Not only would it feel extremely uncomfortable, but it could suffocate the blood flow to your feet. This hurts – and will most likely eventually go numb; preventing you from moving freely on the court. Finally, cushioning inside the shoe in conjunction with the airflow and breathability inside the shoe will all aid in the overall comfort of the shoe. Comfort is ultimately down to you. This probably isn’t really a factor at all; but we’d be ignorant not to include it. Form and style of a basketball shoe is pretty important. While you probably won’t be staring at your shoes during practice or a game, finding a shoe that suits your style needs means that they can be used for casual use as well. And let’s be fair, everyone wants to look good. Just remember, when reading this guide, we focus heavily on finding the best basketball shoe for ankle support. This means that a whole myriad of options have been left out. Every single one of these shoes in our opinion will offer a fantastic amount of ankle support. Whilst you can’t go wrong, it’s always smart to try it on and see how it feels on your own feet. Don’t forget though – look to each and every factor that may be important. Fit, comfort, traction and finding a shoe with a high top is absolutely essential. For us, we just can’t go past the Nike Lebron Soldier IX. If you have any comments or want to drop us a message, don’t hesitate to contact us. Further, if you’ve had great success with a basketball shoe offering fantastic ankle support that we have missed here, feel free to let us know.